Hosting Bangladesh Review 2019: Is Hosting Bangladesh a Good Hosting? Hosting Bangladesh has been offering feature-packed hosting with 24/7 customer service since 2012. You won’t find a website building tool with this vendor, nor an uptime SLA, but it offers some affordable plans with plenty of features. There are four types of shared hosting plan: Starter / Student, Corporate, Premium, and LiteSpeed WordPress. Within each hosting type (or ‘series’) there are different resource levels. All of the plans – even the cheapest Student packages – come with good resource allocations. For beginners, the technical team will migrate your website from your old host free-of-charge. Although there is no website building tool, you do get the Softaculous one-click installer for more than 250 programs. There are also plenty of features for experts. All plans come with multiple FTP accounts, MySQL databases, and phpMyAdmin. There is support for PHP, Python, Ruby on Rails, and the less popular Perl and CGI. You can also schedule Cron jobs and examine error logs. In terms of the infrastructure, all plans come with RAID storage (which protects your data against disk breakage), and you can choose between servers located in Germany or the U.S.A.
Whilst the Hosting Bangladesh website advertises a 99.9% uptime guarantee, I was advised by the support team that this is not backed by a service level agreement. The Starter and Corporate plans are well priced. The features and resource levels are high, and are more than enough for most everyday website owners. However, the higher Premium plans are too expensive and don’t warrant the extra expense. Plans can be bought on one, two, or three-year terms. With no discount for a longer commitment, there really is no incentive to take a three-year term. But if you do, you can take comfort from the 30-day money-back guarantee that lets you get out quick if you think you made a mistake. Customer services told me that SSL certificates are free with all plans, but domain names cost extra. It’s a good thing that the support team is so responsive because there is no publicly available knowledge base to help you help yourself. Hosting Bangladesh has been offering website hosting since 2012 using 100% pure NVMe SSD storage. The higher-tier packages are overpriced, but the lower-tier ones are affordable and feature-packed. 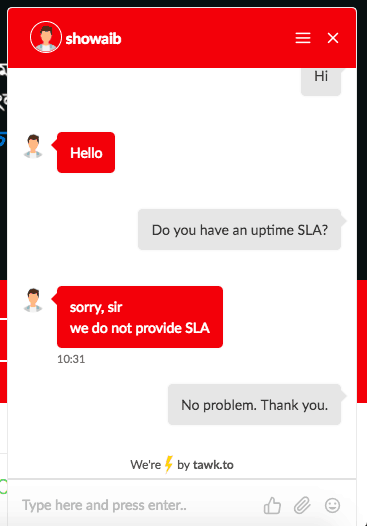 None of the plans come with an uptime SLA, but they all come with excellent 24/7 support. Wondering how Hosting Bangladesh stacks up against other Web Hosting companies? Enter any other Web Hosting company and we will give you a side-by-side comparison.